EARTH CITY, Mo. — It is often said that the biggest improvement for many NFL players occurs in their second season. There is a full offseason program following a year in which rookies are thrown quickly into the mix after the whirlwind that comes with preparing for the draft. Very quickly, those rookies have to learn what is involved with being a pro. As the St. Louis Rams began their final week of organized team activities, one of those second-year players explained the difference in 2014 compared to 2013 even with the production he was able to achieve as a rookie. Now, Stacy is concentrating on simply getting better after a season in which he fell just 27 yards short of 1,000 yards despite having one rushing attempt for four yards in the first four games of the season two of which he was inactive. Running back Daryl Richardson opened the 2013 season as the starter, and had 20 carries for 63 yards in a season-opening win over Arizona. The notion that the Rams suddenly returned to a ground-oriented attack after four games is refuted by the attempts Richardson had in that first game. But Richardson also suffered a toe injury in the opener. He continued to play, but had just 35 yards on 10 attempts in Week 2 against Atlanta. In Week 3, Richardson was 4-for-16 and Isaiah Pead 6-for-20 against Dallas. The worst was a 35-11 loss in a Week 4 Thursday night game against San Francisco when Richardson was benched after a first half total of 16 yards on 12 carries. Benny Cunningham managed just six yards on four second-half attempts. With a few extra days to regroup, the decision was made to start Stacy in Week 5 against Jacksonville. 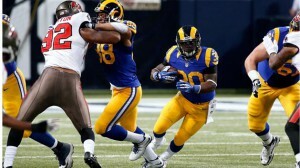 He responded with 78 yards on 14 attempts, the Rams won 34-20 and Stacy became the workhorse. Now, he is competing to keep that job after the Rams selected Tre Mason in the third round of this year’s draft. Richardson was released after Mason was picked. Both Stacy (Vanderbilt) and Mason (Auburn) excelled in the rough and tumble world of the SEC, and Stacy welcomes Mason’s arrival. Offensive coordinator Brian Schottenheimer noted there will be competition at the position and that it also includes Pead and Cunningham. Stacy understands that one season does not a career make. “My goal is to be as productive and as consistent as possible. My main emphasis is studying the playbook and knowing it like the back of my hand. By doing that, I’ll be able to play faster and smarter. Really for me, it’s not the success I had last year. I still have a lot of improving to do. That’s what I’m most excited about, the improvement I can make to be a better running back, be a better complete back, running, protecting and catching balls out of the backfield, so that’s really just my main focus right now. Stacy wasn’t bad in pass protection last season, but he did have a few hiccups. He knows that’s an often unsung part of the job for a running back, especially when he can be the last line of defense before the quarterback potentially gets pummeled. Fantasy Update: Stacy is poised for a big sophomore campaign after an impressive rookie year. He’s a strong, compact runner with good power, and he should benefit tremendously from the addition of rugged rookie lineman Greg Robinson. Even though he plays in a tough division, we highly recommend Stacy in the late first round or early second round of drafts.